Editorial Board of our journal and Organizing Committee of The International Conference on Materials Science, Mechanical and Automotive Engineerings and Technology (IMSMATEC 2019) have agreed to collaborate. Extended versions of the selected papers from the conference will be published in our journal. For more see Events. Editorial Board of our journal and Organizing Committee of International Conference on Innovation, Sustainability, Technology and Education in Civil Engineering (iSTE-CE'2019) have agreed to collaborate. Extended versions of the selected papers from the conference will be published in our journal. For more see Events. 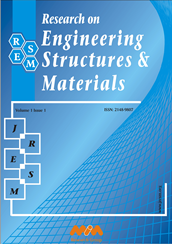 The paper authored by Jouni Freud and Alp Karakoç entitled as “Shear and torison correction factors of Timoshenko beam model for generic cross sections" is awarded the 2018 Most Cited Paper Award of Research on Engineering Structures and Materials (RESM). We congratulate the authors and wish them a continued success. The paper authored by Nelson C. Batista, Rui Melicio and Victor M. F. Mendes entitled as “Darrieus vertical axis wind turbines: methodology to study the self start capabilities considering symmetric and asymmetric air foils” is awarded the 2018 Best Paper Award of Research on Engineering Structures and Materials (RESM). We congratulate the authors and wish them a continued success. Due to the high number of submissions, our journal is going to publish 4 issues per year starting with 2018. Issues are going to be published in February, June, September and December. The 2018 December issue will be published soon. We thank all of our contributors for their support. Our journal submissions and tracking system has been integrated with ORCID. Users with ORCID ID can easily register using their ID to input their personal info. ORCID profile of authors, with their ID recorded in journal system, will be automatically updated when their article is published as online first. Editorial Board of our journal and Organizing Committee of 8° Southern Conference of Computational Modeling and VIII Seminar and Workshop in Ocean Engineering have agreed to collaborate. Extended versions of the selected papers from the events will be published in our journal. For more see Events. We are informed about the inclusion of our journal to Proquest databases approximately two months ago. The details are more clear now. Our journal is started to be Absracted/Indexed by Materials Science & Engineering Database and Engineering Journals of Proquest. New editors and editorial board members have joined the RESM team. We thank them all for their attention and future contributions. Our journal is stronger now with their valuable participation. See Editorial Board for new members. We thank all the applicants for their attention to our journal. There are tens of applications from many members of the scientific community. The editorship call is closed for the time being. The board will evaluate the applications and the successful applicants will be new members of the RESM team. The unselected applicants still have chance to join the team. The received applications are recorded and will be contacted in the future for change in the staff or for further expansions in the journal members. Even if our journal is not currently indexed by Science Citation Index by Thomson-Reuters, first 3 Volumes of our journal, with 40 articles, are cited 42 times (up to given date) by journals indexed in in Web of Science databases. Our readers and authors may find this value important to understand the impact of the articles published in the journal to the scientific community. We are informed that our journal is decided to be included in the TÜBİTAK ULAKBİM TR Index upon the number 41 decision of the relevant Committee dated at 13.04.2018. The inclusion starts with the first issue of 2016. Our journal is also enumerated in the ULAKBİM TR Index website for 2016 and 2017 full journal list. Interestingly, some of the journals in the full list is not shown when the area of the journals are selected like Materials, Civil Engineering. Therefore, check the full list to be sure about a journal inclusion. The data input to the index is not possible for the time being due to Ulakbim system upgrade. We are going to start to input article data after availability of Ulakbim system. According to the data by the journal website hosting provider, for the last 6 months journal website's daily average unique visitor is 38, and the daily average article download is 59. These numbers state that currently everyday 38 different visitors visit our website and downloads 59 articles. The visitor number is increased by 13% from the last year. Some indexes of ours self store the pdf files and readers of them do not have to visit website. The visitor and download values from them is not included in these numbers. Our readers and authors may find this value important to understand the visibility of the papers published in the journal. Even if our journal is not currently indexed by Science Citation Index by Thomson-Reuters, first 3 Volumes of our journal, with 40 articles, are cited 35 times (up to given date) by journals indexed in in Web of Science databases. Our readers and authors may find this value important to understand the impact of the articles published in the journal to the scientific community. Our journal seeks for new team members in the editor position. More information is here. The journal of RESM is open to proposals for special issues on emerging related topics. More information is here. Editorial Board of our journal and Organizing Committee of 13. UKMK have agreed to collaborate. Extended versions of the selected papers from the conference will be published in our journal. Editorial Board of our journal and Organizing Committee of IV. International Ege Composite Materials Symposium have agreed to collaborate. Extended versions of the selected papers from the conference will be published in our journal. Editorial Board of our journal and Organizing Committee of International Symposium on Light Alloys and Composite Materials (ISLAC’18) have agreed to collaborate. Extended versions of the selected papers from the conference will be published in our journal. The paper authored by Yaser Acikbas, Matem Erdogan, Rifat Capan, and Funda Yukruk entitled as “Characterization and organic vapor sensing properties of Langmuir-Blodgett film using perylendiimide material” is awarded the 2017 Most Cited Paper Award of Research on Engineering Structures and Materials (RESM). We congratulate the authors and wish them a continued success. The paper authored by Pilade Foti, Aguinaldo Fraddosio, Nicola Lepore, and Mario Daniele Piccioni entitled as “On the mechanics of corbelled domes: new analytical and computational approaches” is awarded the 2017 Best Paper Award of Research on Engineering Structures and Materials (RESM). We congratulate the authors and wish them a continued success. Our submission and tracking system is upgraded to enhance our service to the contributors. Editorial Board of our journal and organizers of the special session on Fluid Flow, Energy Transfer & Design in scope of the 13th International Conference on Diffusion in Solids and Liquids have agreed to collaborate. Extended versions of the selected papers from the session will be published in our journal. A new submission and tracking system is active to better service to our contributors. By the new system, our contributors can submit their manuscripts and track the evaluation process online. Due to the high number of submissions, our journal is going to publish 3 issues per year starting with 2017. Issues are going to be published in February, June and September. We thank all of our contributors for their support. The paper authored by Raif Sakin and entitled as “Fatigue-life estimation and material selection for commercial-purity aluminium sheets” is awarded the 2016 Best Paper Award of Research on Engineering Structures and Materials (RESM). We congratulate the author and wish him a continued success. Dr. Mohammad Mehdi Rashidi has joined to our Editorial Board. For Authors section is updated for easier initial submission. The editors of the RESM have decided to award the papers with the highest number of citations on a yearly basis. Two years after the publication the paper with the highest number of citations will be given the Most Cited Paper Award. The comparison is made among the ones published in the same year. Dr. Hom Nath Dhakal has joined to our Editorial Board. Our journal is started to be Absracted/Indexed by Global Impact Factor. The paper authored by Yaser Acikbas, Matem Erdogan, Rifat Capan, Funda Yukruk and entitled “Characterization and organic vapor sensing properties of Langmuir-Blodgett film using perylendiimide material” is awarded the 2015 Best Paper Award of Research on Engineering Structures and Materials (RESM). We congratulate the authors and wish them a continued success. Editorial Board of our journal and Organizing Committee of 8th Ege Energy Symposium And Exhibition have agreed to collaborate. Extended versions of the selected papers from the conference will be published in our journal. Dr. Stefano Lenci has joined to our Editorial Board. Our journal is started to be Absracted/Indexed by EZB Electronic Journal Library. Our journal is started to be Absracted/Indexed by CiteFactor. Editorial Board of our journal and Organizing Committee of International Conference on Advances in Applied and Computational Mechanics have agreed to collaborate. Extended versions of the selected papers from the conference will be published in our journal. In order to better service to our readers, change of hosting service provider of our journal is completed. Accessibility of our web site is enhanced with the new system. Editorial Board of our journal and Organizing Committee of III. KompEGE Symposium have agreed to collaborate. Extended versions of the selected papers from the symposium will be published in our journal. In order to better service to our readers, change of hosting service provider of our journal is in progress. Our web site may not be reachable for a short time in the next few days due to operational requirements regarding the change. Dr. Stergios A. Mitoulis has joined to our Editorial Board. Our journal is started to be Absracted/Indexed by Research Bible. Our journal is started to be Absracted/Indexed by Scientific Indexing Service. Our journal is started to be Absracted/Indexed by Universal Impact Factor. Dr. Noël Challamel has joined to our Editorial Board. A new submission system is active to better service to our contributors. Dr. Neritan Shkodrani has joined to our Editorial Board. Our journal is started to be Absracted/Indexed by CrossRef. Our website is updated in order to better service to our readers. Dr. Vadim Silberschmidet has joined to our Editorial Board. Dr. Dennis Lam has joined to our Editorial Board. Dr. Yeong-Bin Yang has joined to our Editorial Board.